Wild animals aren't here for our own vain amusement - just ask this lady who learned that lesson the hard way. Or, better yet, ask the elk who taught her. Jody Tibbitts, who works as wildlife guide in Yellowstone National Park, recently caught on video the exact reason why visitors are told not to get too close to the animals who live there. 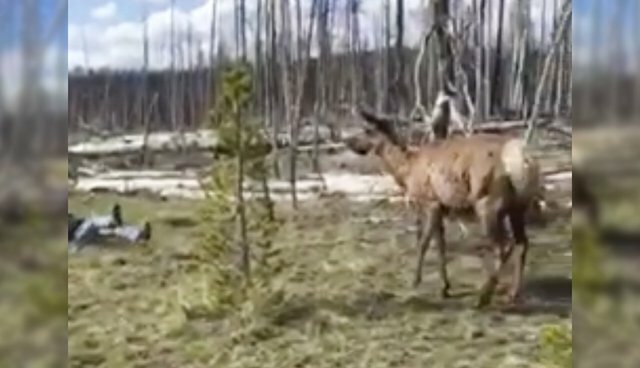 In the short clip, a woman with her phone in hand is seen approaching a rather imposing looking elk who's just hanging out in the brush. That's when she gets the surprise of a lifetime. Fortunately, as Tibbitts write on Facebook, the elk didn't actually launch the impolite selfie-snapper - she tripped and fell on her own. But things could have gone much worse. According to National Parks Service spokesman Jeffrey Olson, there's a growing problem of people putting themselves at risk of being injured by an animal just to snap a photo. "If you're going to do a selfie, you have to use the widest lens you can," he told ABC News. "There is just kind of an ignorant danger, and then there is a whole other level of the really self-obsessed selfie shooters - and what they do is try to close the distance between them and the animal." In other words, keep your selfies to yourself.